I finished the secondary cage this evening. Only thing remaining is to attach the dovetail for the finderscope and cut the struts to the appropriate length. I used Protostar’s Flockboard for the walls. This stuff works great! It cuts and drills cleanly. I used scissors to cut it. I used contact cement to attach it to the rings and double-sided tape to attach it to the focuser board. As you can see above, I did a test fit with the existing struts. This is about 4 inches too long, but it gave me an idea on how it will look. The secondary cage is slightly smaller than the original secondary ring. Close up of the focuser board. Here is a closeup of the focuser board. I used 1/4″ birch plywood I had laying around. I added a 1″ strip of 1/2″ baltic birch plywood to the top and bottom of the board to add some reinforcement. It also gave me a place to mount the focuser board to the rings. Eventually, I want to install a filter slide so this is a place that the slide rails can also mount. 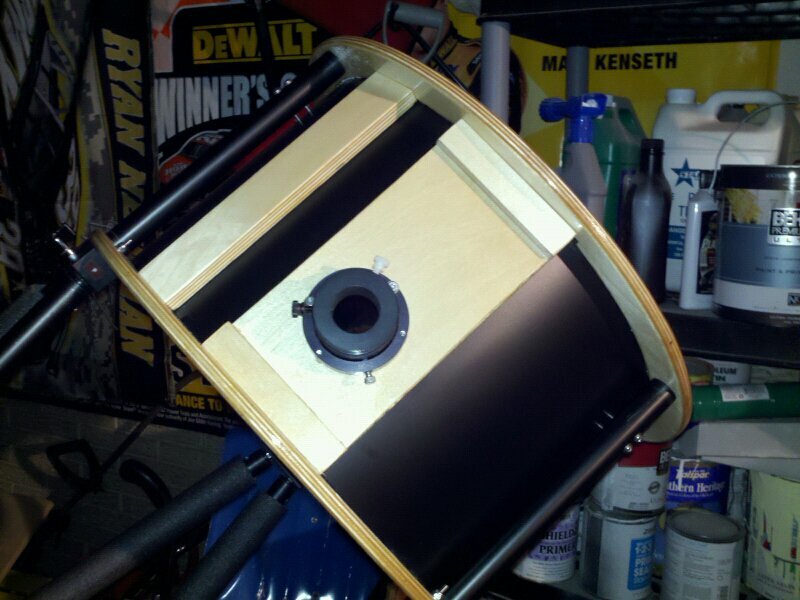 I used staples to mount the focuser and finderscope boards to the rings. This has been successful for me in the past. I used the same glossy polyurethane that I used for the rest of the scope. In regards to the weight, this secondary cage came to just about 6 lbs. The original secondary ring that I had was 5lbs, 13 oz. So I am not gaining much weight here!! 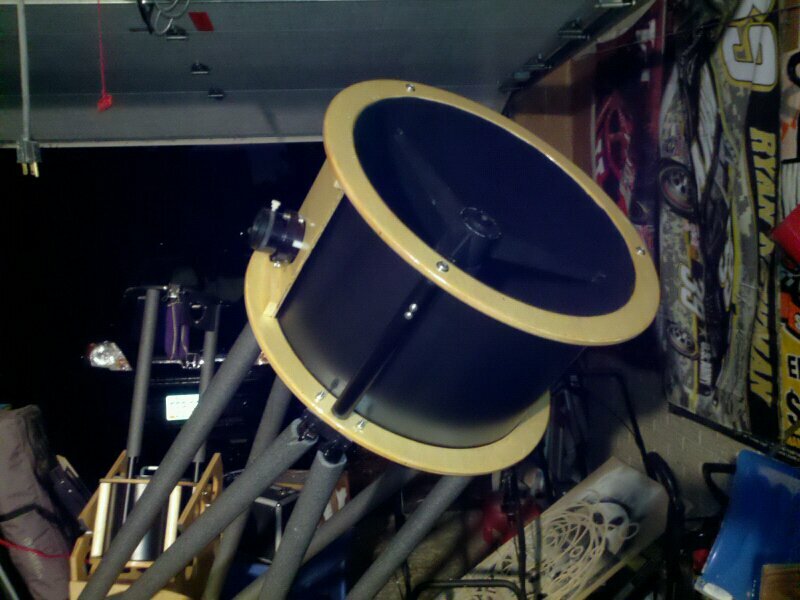 I ordered a Telrad finder from Meridian Telescopes that will attach to one of the cage struts (like what Obsession does). And tomorrow I will cut the tubes to the right length. ~ by jhissong on 2011/05/17.